I love this novel, and I love this movie that is faithful to the novel. I can't give this film enough praise. If you can't read the book, then see this version of the movie. 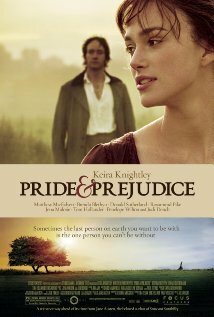 Keira Knightly shines as Elizabeth along with Matthew Macfadyen as Mr. Darcy. Donald Sutherland plays Mr. Bennett exactly as he is in the book - a joy. Everything you get from the book is in here. See this movie! Pride and Prejudice is a humorous story of love and life among English gentility during the Georgian era. Mr Bennet is an English gentleman living in Hartfordshire with his overbearing wife. The Bennets 5 daughters; the beautiful Jane, the clever Elizabeth, the bookish Mary, the immature Kitty and the wild Lydia. Unfortunately for the Bennets, if Mr Bennet dies their house will be inherited by a distant cousin whom they have never met, so the family's future happiness and security is dependent on the daughters making good marriages. Life is uneventful until the arrival in the neighbourhood of the rich gentleman Mr Bingley, who rents a large house so he can spend the summer in the country. Mr Bingley brings with him his sister and the dashing (and richer) but proud Mr Darcy. Love is soon in the air for one of the Bennet sisters, while another may have jumped to a hasty prejudgment. For the Bennet sisters many trials and tribulations stand between them and their happiness, including class, gossip and scandal.